Our cloths are tough enough to handle any job! 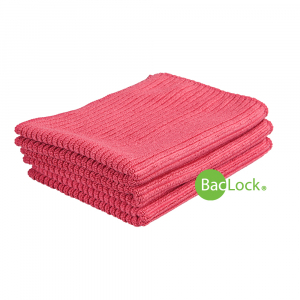 These highly durable, environmentally friendly, microfiber Kitchen Cloths and Towels are super absorbent, quick-drying, non-abrasive and safe on most kitchen surfaces. Scratch-free and lint-free, they won’t harm delicate surfaces like crystal and are excellent for drying dishes. Use them damp to clean grease, grime, smudges and more. The BacLock™* agent inhibits bacterial odor, mold and mildew growth within the product. This means cleaner cloths, less frequent laundering and reduction in cross-contamination. Use them dry to absorb moisture or attract dust and dirt like a magnet and trap it inside. They’re perfect for a variety of surface jobs. Available in 8 colors: Orchid, Buttercream, Pomegranate, Blue, Graphite, Latte, Salmon and Sea Mist. Abrasive cleaning solutions leave a film of broken-down dirt, grime and chemicals dried on your countertops, once the water evaporates. Most towels and cloths just push the dirt around and become soggy quickly. Cloths that have been used heavily should be laundered using Norwex Ultra Power Plus™, which contains no fillers. Do not use bleach, fabric softeners or dryer sheets.